There’s a new bakery in town that you don’t want to miss: Royal Cheesecake and Varieties, who opened their doors on November 19th at the Phoenix Square Shopping Center in Durham. Kenneth and Tamara, a husband-and-wife team, are behind this local business and both never shy away from putting their hands in the “mixer.” The couple moved to Durham from Detroit, Michigan in 2013 to build their dream business here in the Triangle. Why, I asked? “There is a lot of opportunity for small businesses,” said Tamara. 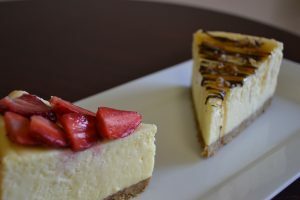 Kenneth is culinary-certified and is the man behind all these delicious cheesecakes, while Tamara claims to be “grandma certified” and makes ooey-gooey cookies, layered pound cakes, cupcakes, brownies and bread pudding! After a warm welcome, I had the opportunity to sit down and dive into these delicious sweets. 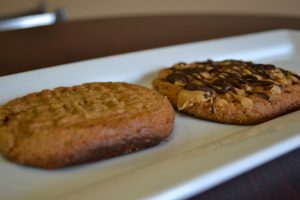 Treated to a turtle cheesecake drizzled with caramel sauce, a caramel layered cake in a jar, and Grandpas dirty secret cookies – which may just be my new addiction – a peanut butter cookie with butterscotch chips, peanut butter, and a dark chocolate drizzle on top. All of their desserts are made from scratch, with only the best ingredients around. The menu changes daily, so be sure to call or stop by often for a variety of offerings. For under $7 you can get a great dessert to bring home or dine in. They are currently open on Tuesday’s from 10am to 4pm and Wednesday through Friday 10am – 5pm. Only more sweet opportunities! Royal is planning on hosting events, dessert flights, and more in the near future. Check out their website for all the details. Or follow them on Instagram and Twitter @rcvcakes.